Today we’re pleased to introduce our last (but not least) Unified Communications platform for 2016. Meet Ombutel, a terrific new GUI-based Asterisk® aggregation that was developed jointly by Telesoft and Xorcom, two familiar faces in the Asterisk community. We racked our brain trying to come up with a simple way to explain all of the things that Ombutel can do. We finally concluded "a picture [really] is worth a thousand words!" As with the other platforms we’ve introduced this year, we think the best way to get started is to install it yourself and kick the tires. For those familiar with FreePBX® or XiVO®, this will be a walk in the park. 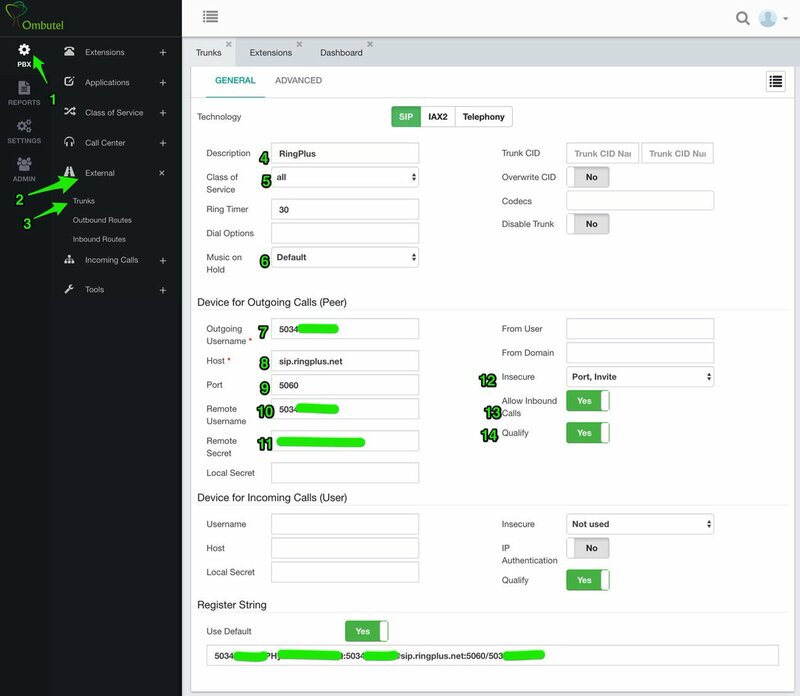 You set up an Extension and Device, configure a SIP Trunk to handle your calls, define an Inbound and Outbound Route to direct calls to their proper destination, load your extension credentials into a softphone or SIP phone, and you’re done. We were making calls after loading Ombutel into VirtualBox in less than 30 minutes. 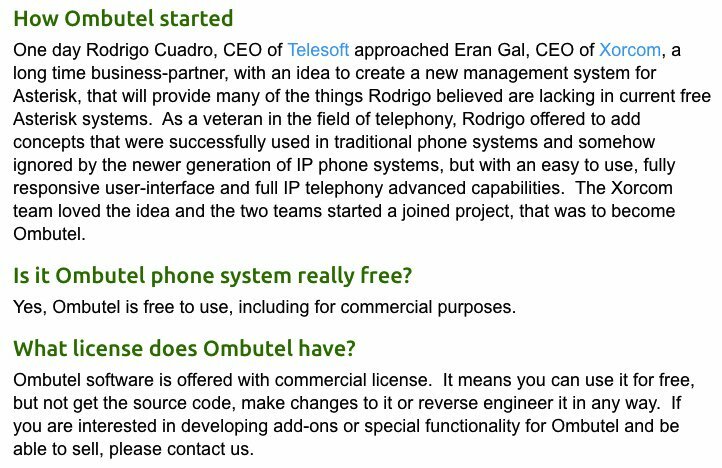 To get started, download Ombutel from their web site. The ISO is approximately 1GB in size. Installing Ombutel. Using the console interface in VirtualBox, we kicked off the install and went through the typical CentOS 7 setup choosing a language, choosing a keyboard, selecting an install destination, and setting up a root password. When the base install completes, you can log in as root to obtain Ombutel’s IP address. All of the remaining setup is completed using a browser pointed to Ombutel’s IP address. Set up an admin password for your server. Then login as admin with your new password. The Dashboard will display. Creating an Extension. 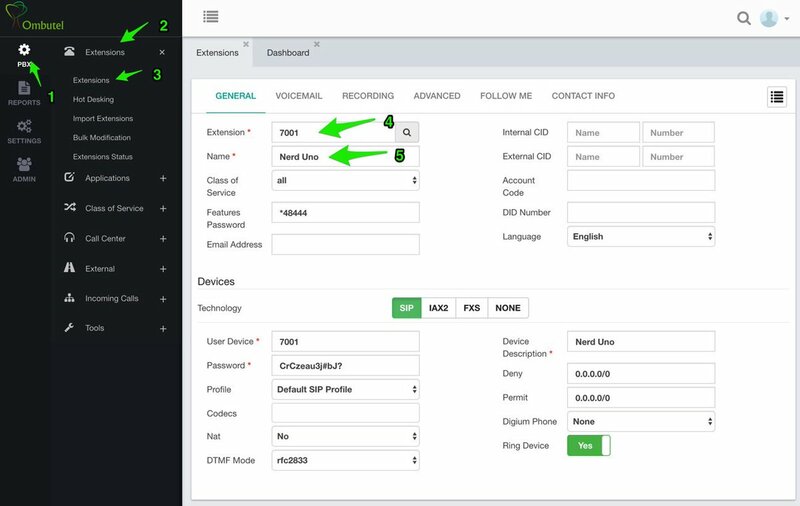 To get started, create an Extension and let Ombutel automatically populate an associated Device: (1) PBX → (2) Extensions → (3) Extensions. The only required entries are the (4) Extension Number and (5) Name. Be sure to set the NAT entry correctly for your network. Once you’ve completed the entries, click the Save button and then the red Reload icon. Notice the list icon in the right column of the window. Clicking on the List pull-down will show all of the extensions you created and allow you to edit them and decipher whether a particular extension is active. Adding a SIP Trunk. Adding Trunks is equally straight-forward: (1) PBX → (2) External → (3) Trunks. Then fill in the dozen items with your own credentials and settings. 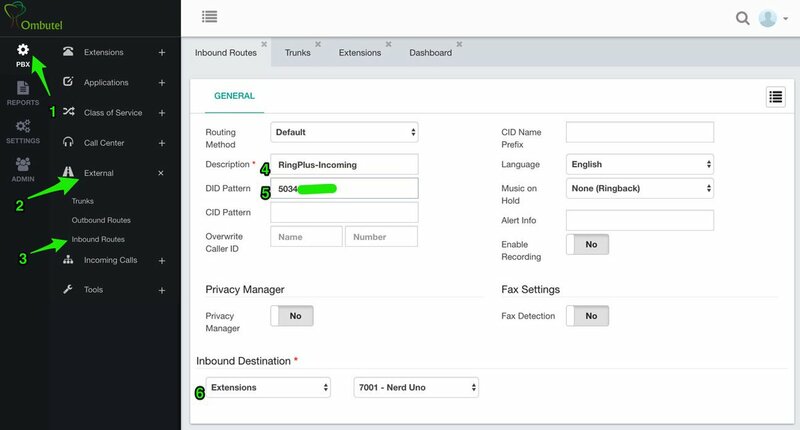 We’ve used a RingPlus SIP trunk as an example. NOTE: Be sure to set the From User field to your 10-digit RingPlus number even though this is not shown in the screenshot below. Once you’ve completed the entries, click the Save button and then the red Reload icon. As previously noted, the list icon in the right column will display all of the Trunks you’ve created. Configuring an Incoming Route. As with other PBXs, incoming routes define how calls from individual DIDs are routed once they arrive. The minimum requirements to set up an Incoming Route are a Description, a DID Pattern (usually the number associated with the DID), and a Destination for the incoming calls. Once you’ve completed the entries, click the Save button and then the red Reload icon. As previously noted, the list icon in the right column will display all of the Incoming Routes you’ve created and let you edit them. Configuring an Outgoing Route. As with other PBXs, outbound routes define how calls are routed out of your PBX based upon the dial string. You can choose one ore more trunks to associate with each Outbound Route. The dial string for each outbound route needs to be unique. Once you’ve completed the entries, click Save and then the red Reload icon. Just to Be Safe, Restart Asterisk. Ombutel still is fairly new code. We’ve found that a quirk occurs once in a while during all of the initial configuration. This typically can be squared away (e.g. extensions not connecting) by restarting Asterisk: /etc/init.d/asterisk restart. Setting Up a Softphone to Connect to Ombutel. If you’re a Mac user, you’re lucky (and smart). Download and install Telephone from the Mac App Store. Start up the application and choose Telephone:Preference:Accounts. Click on the + icon to add a new account. To set up your softphone, you need 3 pieces of information: the IP address of your server (Domain), and your Username and Password. With Ombutel, choose PBX → Extensions → Extensions. Then click on the List icon and click on the extension to which you want to connect. 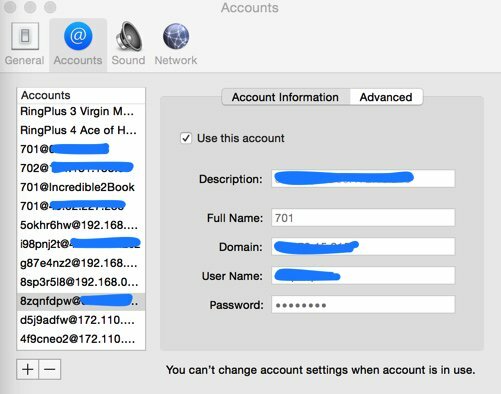 Now copy or cut-and-paste your User Device number into Username and Password into Password on the Accounts dialog of the Telephone app. Click Done when you’re finished, and your new softphone will come to life and should show Available. Dial the same extension (7001) to test things out. With Telephone, you can use over two dozen soft phones simultaneously on your desktop. For everyone else, we recommend the YateClient softphone which is free. Download it from here. Run YateClient once you’ve installed it and enter the credentials for the XiVO Line. As with the Telephone app above, you’ll need the IP address of your server plus your User Device and Password associated with the desired extension. Click OK to save your entries. You can check these for yourself in /etc/firewalld/services, and you can list the default firewall setup like this: firewall-cmd --list-all-zones. In fairness to Ombutel, their firewall design is no worse than what you will find with AsteriskNOW or the FreePBX Distro or Elastix. Incredible PBX and PBX in a Flash powered by 3CX take a different approach and don’t put all the responsibility for network security on the system administrator. We simply don’t have sufficient confidence in any Asterisk platform to risk exposing SIP, IAX2, HTTP, and SSH to the Big Bad Internet. For the time being until we can complete work on Incredible PBX for Ombutel, we recommend you run Ombutel behind a hardware-based firewall that does not expose these ports to the Internet for anyone and everyone. Where To Go From Here. Ombutel has an awesome collection of video tutorials that should be the next stop in your Ombutel adventure. We’ve barely scratched the surface of this powerful platform, and there are still some missing pieces such as Google Voice. For the time being, you can use the Simonics SIP to Google Voice gateway to add this functionality. See this recent tutorial for some hints and a discount coupon. An Early Stocking Stuffer from Santa. We’ll leave you with a quick tutorial on how to install FLITE so that text-to-speech can be used in your Asterisk custom dialplan.1 In addition, we’re releasing the first of many Incredible PBX components for Ombutel with our Yahoo News application. After installing it, just dial *951 from any extension to listen to the latest Yahoo News Headlines. Both FLITE and the news application are GPL2 open source code. We’ll have more goodies to share with you in coming months. asterisk -rx "core show application like flite"
A final cautionary note to would-be Ombutel developers. You can’t use Feature Codes such as *951 as Destinations in the Ombutel GUI. Instead, you first will need to create a Custom Application as shown below. 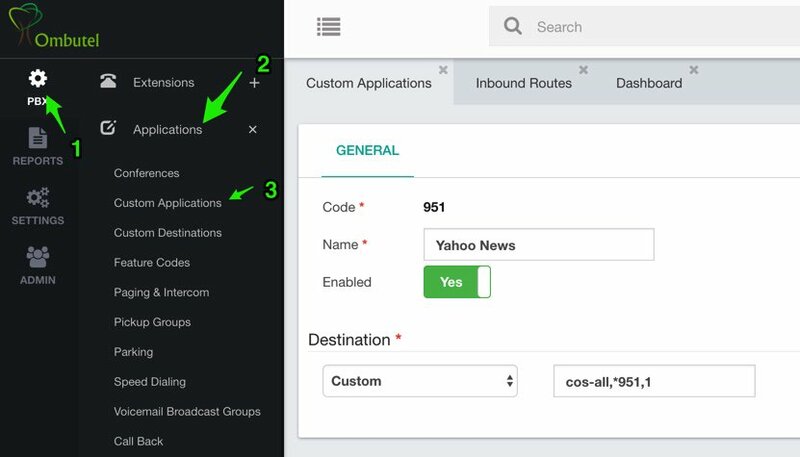 Then you can use Custom Applications → Yahoo News as a Destination in components such as IVRs and Inbound Routes. Enjoy! Loving the look of Ombutel. A lot more straight forward to implement than my other favorite, Xivo. Will we be seeing integrations of Superfecta etc. as in Xivo? I find Ombutel very interesting. My only concern is about properly registering the GoIP as a sip trunk for incoming calls. Outgoing calls are ok but incoming calls is still a challenge. Any help would be appreciated. Thank you. Our engineers are in the forum and they can help. Incredible PBX is based on PBXinaFlash, but today PBXinaFlash is sold to 3CX company! What happens with the project incredible PBX? Almost died to like Elástix? I don’t like Elástix, why? Is based on FreePBX, not directly from Asterisk. Why Incredible PBX no have version based on FreeSwitch? Like FusionPBX or sipXces?